I love spring! This winter we had a flood, a terrible snowstorm, an even worse ice/snowstorm, and another flood. This was in addition to a regular New York winter. We took some damage to a car and lost a bunch of trees. The ice storm damaged the remaining trees so badly that we'll have many more falling for the rest of the year. At the front of our property, part of a very large tree fell onto the road last month. The remaining part of the tree was split and was just waiting to fall. We made the very exciting decision to have the tree taken down. Who needs a summer vacation anyway? In this photo, half of the tree is already down. As we are hauling all of that wood up the mountain to our wood pile, we're playing the "guess how many cords of wood it is" game. We figured we've hauled up 2 cords already and the log pile on the street doesn't look any smaller yet! And as you can see, tree removal is a spectator sport in my neighborhood. It was an honor to make this quilt (the first one, specifically) with my friend Kim. She pieced it; I quilted it. Why was it an honor to quilt a quilt? It's something I do every day after all. Well, this quilt was made for Quilts of Valor to be given to a wounded serviceman/servicewoman. 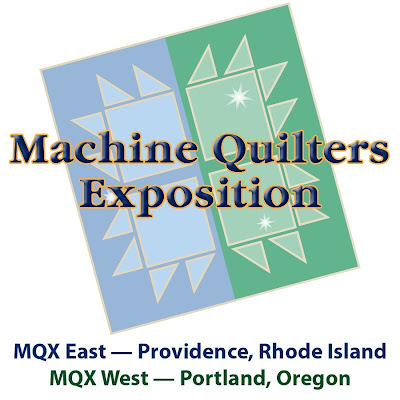 When I went to MQX, I dropped off a stack of quilts to the Quilts of Valor booth and ran off to work. The next day (or the day after that?) someone from Quilts of Valor let me know that this specific quilt was given away. Patrick, a young serviceman, is being shipped home for surgery and the Governor of Rhode Island presented this quilt to his mother! I actually got to meet mom (Debbi). We hugged and she told me about Patrick and we all ended up crying like fools. Want to share in this honor? Check out Quilts of Valor and see how you can help. Thanks to everyone who commented for a chance to win Beyond the Lines: Quilting Designs for Hand, Machine, and Longarm Quilting. I used the random number generator and was going to paste a photo of it on my blog but apparently that technology is just out of my reach. Please trust that I was honest. If you would like to purchase the book, it can be ordered online from the Quilt Basket. Don't forget about my give-away! My husband's baby cousin is getting married next week. This boy was about 2 years old when I came into the family, but since my own son is now 23 I suppose Michael has had some time to grow up a bit since then. I had all of the fabrics in my stash except for the backing. The backing fabric was yummy and perfect (and on sale!). I'll make my true confession for Sunday's Stash Report. Sorry for the oddly-lit photos. I finished the quilt last night and took the photos this morning before the sun had time to fully rise. I have to leave for work soon! Passers-by thought I was weird for taking a picture of a radiator. At least I wasn't the one who wrote it! This week my blog-meter registered 50,000 hits. That feels like a milestone to be celebrated. I think it's time for a give-away! How about a drawing for a copy of my book? 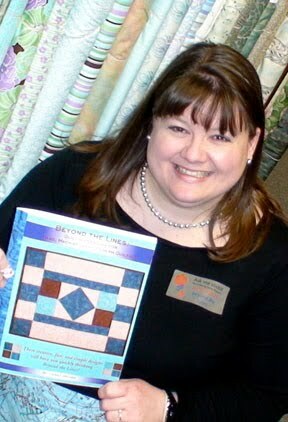 It's called Beyond the Lines: Quilting Designs for Hand, Machine, and Longarm Quilting. Leave a comment letting me know that you'd like to be entered in the drawing. Comments close Monday, April 26, 2010 at noon EDT. In case you wondered, that definitely is a Hello Kitty bandage on my finger in the photo. Why a Hello Kitty bandage? Because I was out of Shrek bandages, of course. Bonnie and I met up at MQX, and she insisted on taking my photo. In my defense, it was after 10pm and I'd been working in the classroom since 7:30 am. I had just changed out of my work clothes and was in my casual jeans, hoodie, and pony tail. I'm home from MQX and working on my new quilt along. I am using a bunch of patriotic fabrics from my stash so I can donate this quilt to Quilts of Valor. I used a 4-inch triangle template, but it wasn't an equilateral triangle. I switched over to my regular ruler and used the 60-degree line. It worked like a charm! My daughter is friends with triplets so I got to make three graduation quilts. John likes purple. A lot. Last year my daughter asked for 10 graduation quilts, and this is number ten. I am done!!! 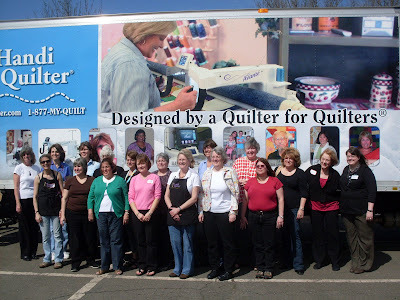 Debbie, owner of Quilting Possibilities in Forked River, NJ, posted about her Handi Quilter training in Connecticut last week. It starts this week. I'll start next week after I'm home from MQX! 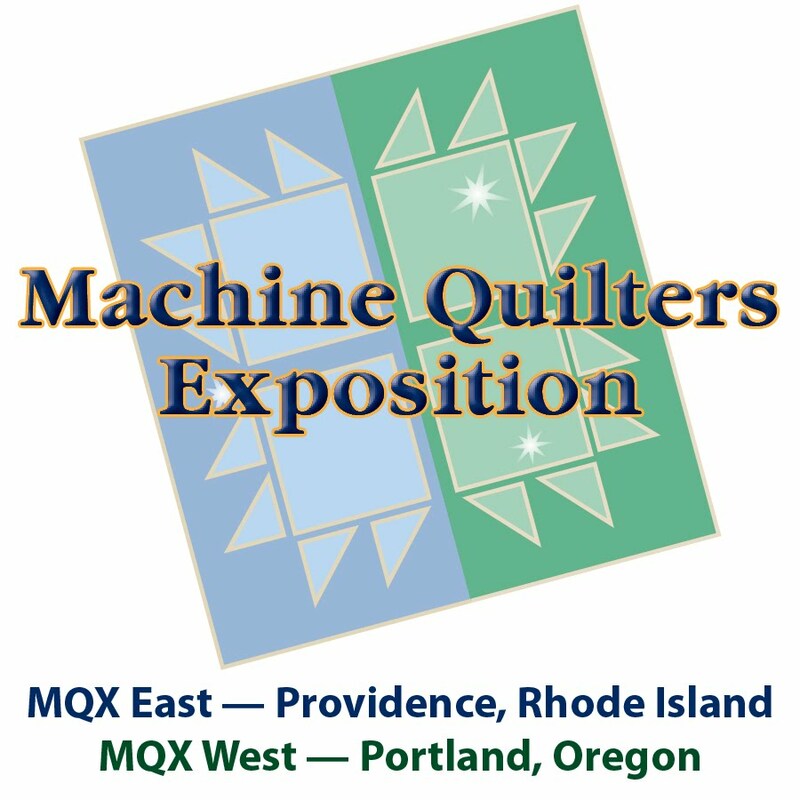 At MQX, of course... it's where all the cool people will be this week. Come to Rhode Island! OK, I busted over 100 yards of fabric this year. I'm pretty excited, but why can't I see a difference in my sewing room? It's still full of fabric! Maybe the next 100 yards will make the difference? 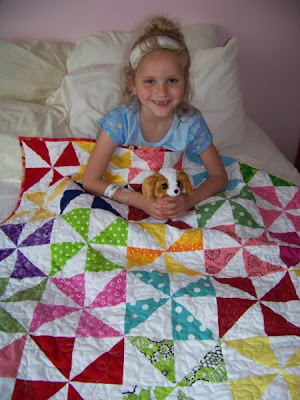 Last week I showed you pictures of a pinwheel quilt for a special little girl. Celebrate with us! For details on Lydia's surgery and recovery, check out her grandma's blog. 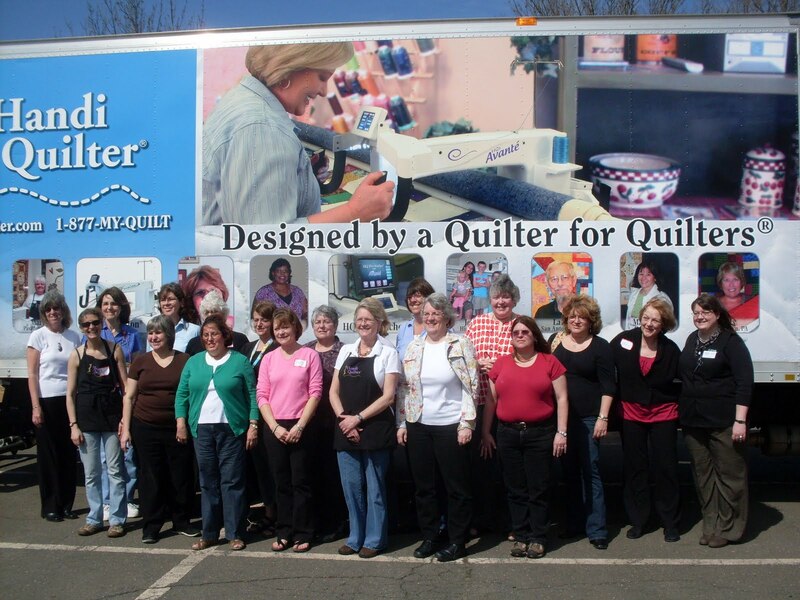 I just had a great day with some quilters on Long Island. I hope they learned a lot; I surely learned a lot from them! The quilt is a pinwheel quilt along from Old Red Barn Co. I quilted some all-over cabbage roses and leaves, just to keep it fun. 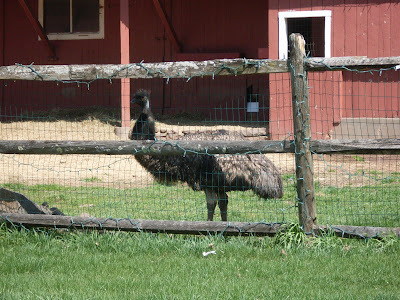 ... and I got to see an emu, too! Earlier this week I mentioned that I did a little bird watching, but I never mentioned why I was headed to Connecticut. 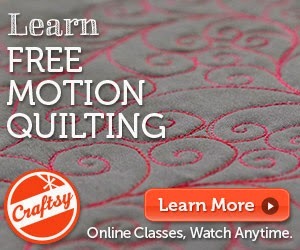 For more Handi Quilter love, of course! I spent two days with ladies from New York, Ohio, Maine, Vermont, Maryland, Pennsylvania, Massachusetts, New Jersey, New Hampshire, Connecticut, Indiana, South Carolina, and one gentleman from Louisiana. Fun fact: 16% of us were named Debby/Debbie. So, the pinwheel quilt from Old Red Barn Co. is pieced. It's 40x40. I have a special little girl in mind for this quilt. I started screaming "An ostrich? Is that an ostrich? Maybe an emu? I should go back and take a picture." So I did. Well dear reader, is this an ostrich? or maybe an emu? Pinwheels are like potato chips... I bet you can't make just one! I had enough white fabric to make 25 blocks so I used 25 different bright fabrics in these blocks. 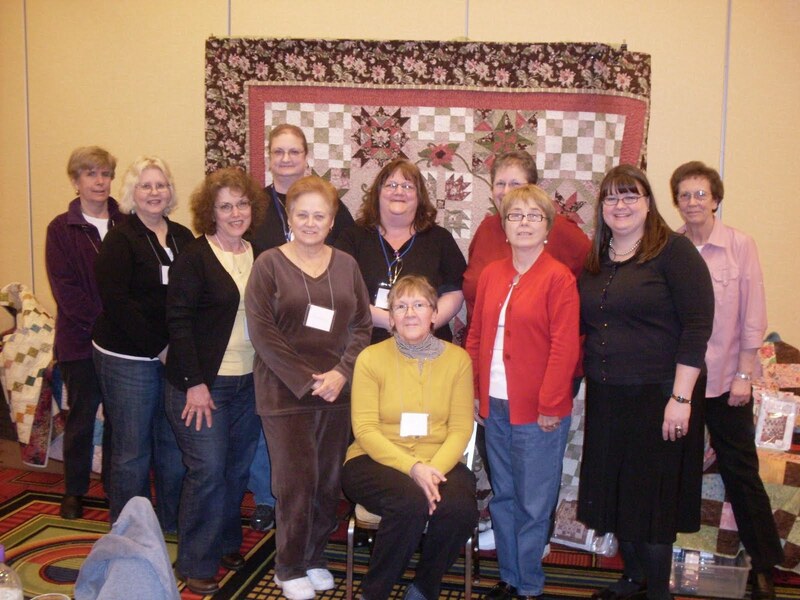 Old Red Barn Co. hosted a pinwheel quilt along. I quickly grabbed up my bucket of bright nickel squares and started piecing. I pulled out all polka dots to start. I don't have enough spots to make this an exclusively dotty quilt, so I'm going to add some non-spotted fabrics to the quilt. I am blessed. I have many wonderful people in my life. People I love a lot. I love to give them gifts, and they love the gifts they receive. They love them so much in fact, that they beg for more. ... she'll want a set of snowflake potholders for January. ... she'll want heart potholders for February. ... she'll want shamrock potholders for March. ... she'll want Easter potholders for April. That's a whole lot of binding. Just sayin'. Leftover watermelon fabric from another project. BBQ fabric for June. Mom already has these. Leftover orange/pink fabric from another project. *the same goes for "friend", "sister", "daughter", "daughter-in-love", "mother-in-love", etc. They all collect potholders. I just returned from 13 days on the road ending with the first AQS show in Lancaster PA! It was such a rush to be there, and I spent weeks preparing so my classes would be "just right". I've done a lot of teaching and a lot of travelling and I know to plan some down time when I return. I take the first day home and spend it in my sewing room engaging in 'quilt therapy' or 'recovery quilting'. What am I going to do with the leftovers? I pulled out a barely started scrap quilt that has 2 1/2" x 6" sashings. Should I continue with that project (I'm thinking no), or should I just toss those few strips and all my leftovers into a bag for my crumb-quilting friend? Does anyone else get paralyzed by these enormous life-and-death decisions? I hope this recovery takes, because I'm on my way back out the door for another 14 days of teaching!